If you can afford it, you can own the one and only original Batmobile when it goes up for auction by Barrett-Jackson, the famous classic car auctioning business. I get Speed TV as part of my satellite package and they will be airing the auction live. It will be interesting to see just how high the bidding goes for this beautiful piece of pop-culture history. You can read more about the history of the car by going HERE. The original Batmobile goes on the road once again Tuesday when it is transported from creator George Barris’ collection in Los Angeles to Scottsdale, Arizona, to be auctioned at the Barrett-Jackson collector-car event in January. 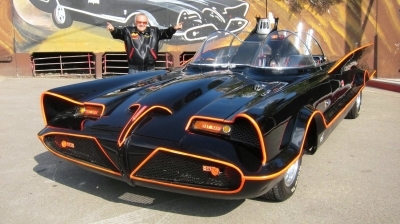 The world-famous TV car built by Barris and his customizing crew in 1965 for a starring role in the Batman show will be loaded into a van Tuesday morning for the 380-mile trip to Scottsdale, where it will be delivered to Barrett-Jackson. The Batmobile will be a star attraction at the January auction, marking the first time the iconic TV car has ever been offered for sale. Barris has kept the Batmobile in his possession since it was driven in the 1966-68 television show, although it has made many appearances at auto shows and other events through the years. The custom-car project was famously built at Barris’ shop in just 15 days after the legendary “King of Kustomizers” was approached by the producers of the upcoming Batman series, who needed the car built within weeks to appear in the show. 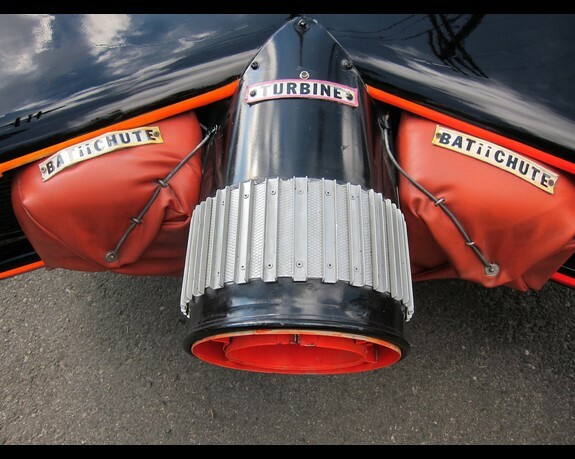 The Batmobile is based on the 1955 Lincoln Futura show car that Barris already had in his possession, and he and his crew heavily modified it into one of the best-know vehicles in TV history. 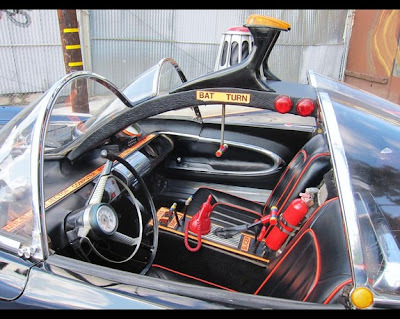 Among the car’s special features created for TV are the many faux crime-fighting gadgets used by Batman, such as the Bat Ray, Bat Computer, Bat Smoke and the memorable Bat Phone. The auction of the Batmobile is scheduled for Jan. 19 during the Saturday “prime time” sale at Barrett-Jackson. 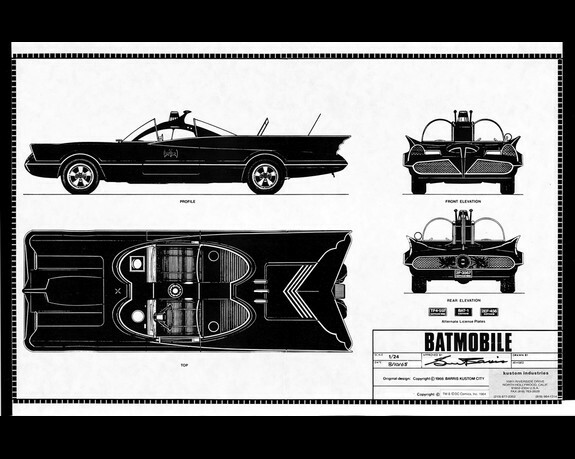 The winning bidder of the Batmobile will also receive memorabilia and documentation from Barris's personal archives. 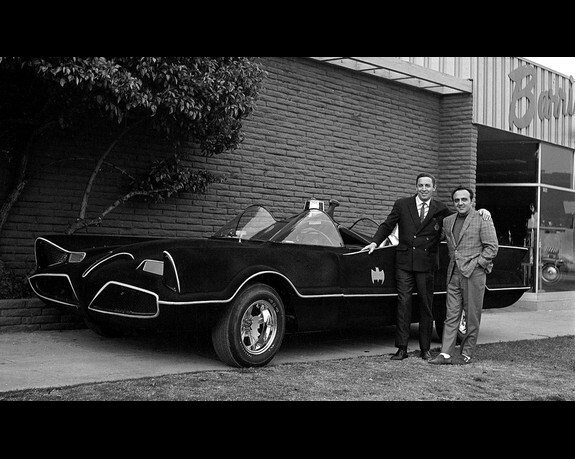 Batman creator Bob Kane (left) with George Barris and the completed Batmobile. George Barris copyrighted his Batmobile design. The Batmobile is equipped with an array of faux crime-fighting gadgets. The Batmobile's special features are clearly labeled.